Posted on August 8, 2016 at 4:46 pm. Six men have been arrested in Indonesia over suspicion of plotting a terrorist attack against Singapore’s Marina Bay, an upscale waterfront area popular with international tourists. 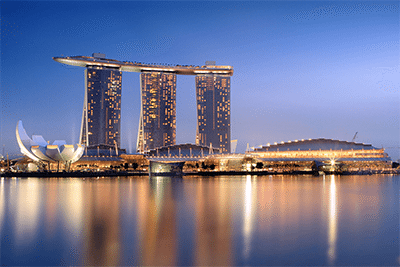 Amongst its dining, retail, residential and entertainment offerings, the Marina Bay Sands resort and casino is one of Singapore’s most popular tourist destinations and forms an iconic part of Singapore’s skyline. On Friday, Indonesian officials announced the arrest of six individuals aged between 19 and 46 at several locations around the Batam area in Indonesia. Police say the men had a plan that allegedly involved firing rockets at Marina Bay from the island of Batam, across the Strait of Singapore. Officials have said it’s not clear whether the men had the ability to carry out such an attack, but have seized weapons after raids at multiple locations. It’s unclear as to what type of weapons were found but a neighbour of one of the arrested men told media the weapons included an assembled bomb. The men form part of a little-known terror group known as Katibah GR, or Cell GR. Five of the suspects work in an electronics factory, while one is an employee of a bank. Police are investigating whether the men are linked to Muhammad Bahrun Naim, the suspected mastermind behind the 2016 terrorist attacks in Jakarta that resulted in eight deaths. There is no evidence to suggest whether the casino was a specific target in the plot, although a report released following the Jakarta attacks by Hong Kong risk consultancy Steve Vickers and Associates predicted Macau casinos could be a potential target for a soft terror attack in the future. The report citied Macau casinos as a target due to the connection of Chinese, American and Jewish interests that could appeal to a terrorist group.